I started riding in the early 80’s. Somehow I got a hold of a yz80 and tore up every dirt field I could find close to my house. My next bike was a KLR 650. I loved to be able to leave my house and explore the Sonoran Desert that stretches out in all directions. My first street bike was a 99 Dyna Wide Glide. I got involved with a business associate who went to the Laughlin River Run every year. In 2010 I decided to ride to Sturgis. 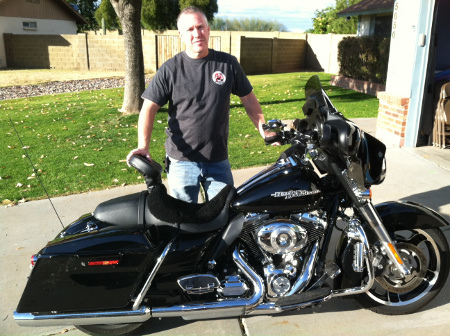 The Wide Glide did a great job but I was ready for a little more power and comfort. My current bike is a 2011 FLHX! My first LDR ride was an all-night easy rider from my house, ending in Blythe, Ca. Where we hooded up with friends and rode on to Laughlin. My second was part of my FAVORITE RIDE. Riding the first 1000 miles (on my Street Glide) on my way to Sturgis. Covering those miles in the allotted time and crossing six state lines. After spending the weekend in the Black Hills I headed out across Montana making stops at the Battle of the Little Bighorn and Red Lodge before making my way across Bear tooth Pass! (Highly recommend you add this to your bucket list). Spent the next day riding around Yellowstone and spent that night in Jackson Hole, WY. I then stayed in Beaver, UT and rode the rest of the way back to Phoenix by way of Lake Mary road from Flagstaff, AZ to Payson, AZ (another highly recommended road). All said and done it was a 6 day 3,403mi ride. Future Rides: I’m putting together a 1,500 mile Northern Arizona ride that will include Jerome, Oak Creek Canyon, the North and South rim of the Grand Canyon, Sunset Crater, Meteor Crater, and the White Mountains!